Acaiá: A rare Mundo Novo mutation found mainly in Brazil. Anacafe 14: A spontanously generated Catimor-Pacamara hybrid that was further developed and released by Anacafe in 2014. The variety is said to be rust resistant and productive of high cup quality. Andong Sari: Variety developed from a popular Catimor that was brought from Colombia to Indonesia and has been hybridized with Caturra and Hibrido de Timor (HDT). Arusha: A subvariety of Typica/Bourbon of uncertain origins found most commonly in Tanzania and Papua New Guinea. Ateng: A common name for Catimor coffees widely planted in Sumatra and other Indonesia isles. Batian: Released in late 2010, this disease resistant strain is named after the highest peak on Mt. Kenya. Blue Mountain: A Typica mutation originally found and cultivated in Jamaica’s Blue Mountains. Bourbon/Borbón: A flavour and aroma reminiscent of blackberries or blueberries. Some of the best coffees of East Africa and the Arabian Peninsula have these characteristics. Bourboncillo/ Bourboncito: Dwarf bourbon grown widely in Guatemala and other Central American countries. Castillo: An improvement of the Colombia variety developed by Colombia’s National Center for Coffee Investigation (Cenicafe) and currently the most planted variety in Colombia. Catigua: A cross between Catuai and Hibrido de Timor developed in 1980s by The Agricultural Research Company of Minas Gerais ("EPAMIG"). Catimor: A hybrid of the Timor Hybrid (resistant to coffee leaf rust due to its Robusta genetic roots) and Caturra developed in Portugal in 1959 and introduced to Brazil in the 1970s. Catuaí: A hybrid of Mundo Novo and Yellow Caturra developed by the Campinas Agronomic Institute (ICA) in Brazil in 1949. Catucaí: A hybrid of Icatú and Catuaí that exists in both red and yellow form. Catucai-açu: A strain of Catucaí (sometimes appears as Catucaiaçu or Catucaí Açu) registered by Brazil's Programa de Apoio Tecnológico à Cafeicultura (Procafe) in 2000. Caturra: A natural hybrid of Bourbon that has been responsible for profound changes and improvement in the coffee industry worldwide. 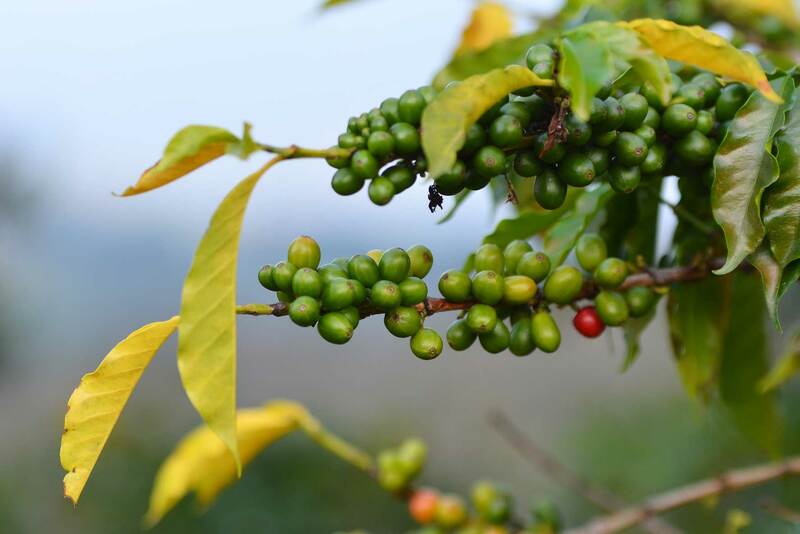 Colombia: The result of successful hybridization of Caturra with the Timor Hybrid developed over five generations by Cenicafe between 1968 and 1982. Costa Rica 95: A cross between Timor Hybrid 832/1 and Caturra. Pedigree selection (selection of individual plants through successive generations) made by the Instituto del Café de Costa Rica (ICAFE). Criollo/Criolla: Anatural mutation of Typica common in Peru, Bolivia and Colombia. Erecta: Could refer to Erecta or Caturra Erecta. Please click for more information. Garnica: A cross of Mundo Novo and Caturra developed by the Mexican Institute of Coffee (INMECAFE) in 1960. Found primarily in Veracruz and Chiapas, Mexico. Geisha/Gesha: A once-rare variety that was ‘rediscovered’ in Panama in 2004. Widely considered one of the most complex, intensely flavoured and desirable profiles of all the coffee varietals. HDT (Hibrido de Timor) / Tim Tim: A cross between Arabica and Robusta and extensively used as a gene source in different breeding projects with the purpose of breeding in a higher resistance towards leaf rust and other diseases. Icatú: A variety first developed in Brazil by the Instituto Agronômico de Campinas (IAC) and known for its high productivity and good disease resistance. IHCAFE 90: (also known as IH-90) A Caturra/Sarchimor cross developed by the Honduran Coffee Institute (IHCAFE) during the 1990s. Jantung: A Typica strain originating from the Aceh region of Sumatra. Java: A variety receiving its name from the island of Java in Indonesia. Kent: Thought to be a natural mutation of Typica discovered in India, this variety is widely found in Kenya today. Lempira: Considered to be a sub-variety of Catimor that is found mainly in Honduras. Longberry: Variety, primarily emerging from Indonesia, named due to its appearance, which is long and thin in comparison with other coffee varietals. Maracaturra: A Brazilian hybrid of Maragogype and Caturra. Maragogype: A natural mutation of Typica first discovered in the town of Maragogipe, Bahia, Brazil. Marsellesa: Variety obtained from the hybridization of Sarchimor and Caturra. It is sought after for its superior cup quality and its resistance to leaf rust. Mocha/Moka: Can refer to a variety originating from Yemen or a mutation of Typica that is commonly grown in Brazil and Hawaii. Click link for more info. Mundo Novo: A natural hybrid of Typica sub-varieties, Sumatra and Bourbon. Obata:A cross between Timor Hybrid 832/2 and Villa Sarchi CIFC 971/10. Pedigree selection made by the Instituto Agronomico (IAC) of Sao Paulo State in Campinas, Brazil. Released in Brazil in 2000, and brought to Costa Rica for commercial release in 2014 by the Costa Rican Coffee Institute (ICAFE). Oro Azteca: The first resistant coffee variety developed and registered in Mexico. The variety is from Catimor (Timor Hybrid) root stock bred with Red Caturra. Pacamara: A hybrid created in El Salvador by the Institute for Coffee Research (ISIC) by crossing the Pacas variety (an El Salvadoran mutation of Bourbon) with Maragogype. Pacas: The result of a natural and spontaneous mutation of Bourbon and discovered in El Salvador, where it is most commonly found today. Pache: A natural mutation of Typica, originally discovered in Guatemala. Pluma Hidalgo: A “Typica” progeny first cultivated in Mexico and introduced to the area known as “Pluma” (within the Loxicha region of Southern Oaxaca). Rasuna: A Sumatran hybrid of Catimor and Typica, which appears to be grown only in Indonesia. Rubi: A hybrid of Mundo Novo and Catuaí engineered at the Agronomic Institute of Campinas (IAC) during the 1960s. Ruiru 11: A disease resistant variety grown widely in Kenya. S795: Commonly known as “Jember” by Indonesians, the variety is thought to be the cross of S288 (a natural hybrid of Liberica and Arabica) and an old Kent variety. San Francisco: A Bourbon and Pacas hybrid hailing from El Salvador. Also known as Hibrido de San Francisco. Sarchimor: A hybrid of the Costa Rican Villa Sarchi and Timor Hybrid grown widely throughout India and Costa Rica. SL - varieties: Including SL-28 and SL34, these varieties were developed by Scott Laboratories - a research organisation based in Kenya that developed multiple cultivars under contract between 1934 and 1963. Click link for more info. Tabi: A variety obtained by crossing Typica, Bourbon and Timor Hybrid, developed by Colombia’s Coffee Research Institute (CENICAFE). Topázio: Variety obtained from the cross of Mundo Novo and Red Catuaí and then backcrossed again with Catuaí. Developed at the Agronomic Institute of Campinas (IAC) in Brazil. Toraja Toraja: A natural Typica mutation named after a region in Sulawesi known for growing a coffee called Tana Toraja (or ‘Land of Toraja’). Typica: Variety that forms the genetic backbone of much of specialty coffee today. The first coffee plantations grown in America and Asia were of the Typica variety and many of the most widely cultivated C. arabica crops today are descended directly from the plant. Venecia: A variety originating in San Carlos, Alajuela and discovered on a coffee plantation of 100% Caturra. It was selected out as it demonstrated increased productivity, larger fruit size and increased resistance to fruit drop in the rain. Villa Sarchi: A natural mutation of Bourbon varieties originally bred in Costa Rica in a village called Sarchi.